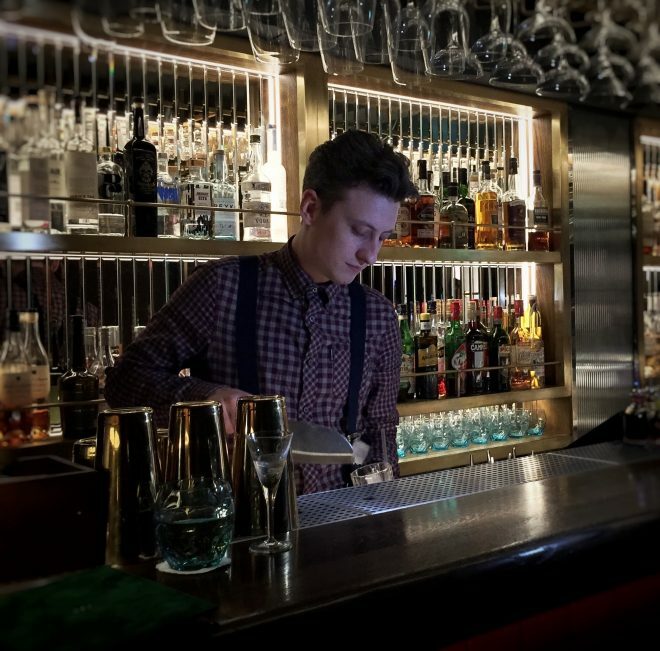 Will Hawes is bar manager at Disrepute in London. He makes two cocktails for us, one with Cognac and Peach Cream and the second with Rum and Merlet Cassis. I think I started the same way as most people… I fell into it. A friend started working in a bar and so I followed him there, that was ten years ago. I started as a bar back and worked my way up until I was the head bartender. I moved down to London where I began to work in hotels, I moved to Zetter Townhouse, Milk and Honey, 69 Colebrooke Row, El Camion and was there until I came to open Disrepute. I’d open a bar that’s not a bar in London, because I love London. My bar would actually train people in hospitality, bartending, making drinks and food. I’d also give pupils pop-up bars to run to train future managers. I’d want trainers from various areas of expertise and as you guys are magicians I’d assemble the Avengers of the hospitality world. I’d have Nick Copputo for his service capabilities, Rosie Mitchell for her lab experience, oh and if I could have a chef, let’s go for Feran Adria. I do love computer games and of course I check out other bars and restaurants. When I do have more time I go home to the countryside to see my Mum. I like the floral notes you get with cognac. Everything tastes better with a splash of cognac in it. For me, anyone can drink cognac. I can’t believe I didn’t say tequila. The ambiance of the bar and the overall experience you have. And of course, dilution. Picon because the bitter notes really add to a drink. I find it enhances a cocktail and adds to the balance. Go and see Rosie Mitchell at 69 Colebrooke Row and Alex from Dandelyan in London. In Singapore, go to the Cufflink Club and talk to Andrew Goodall.